Antique Caucasian Eagle Kazak Rugs – Chelaberd antique rugs are often referred to as Eagle Kazaks. 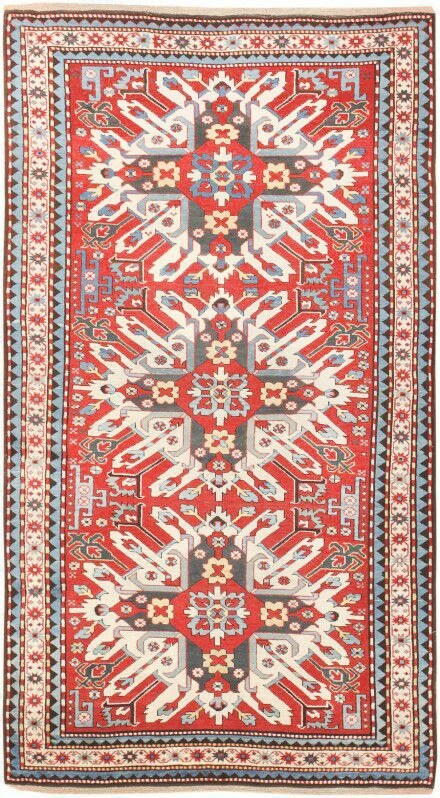 Although the design of these rugs shows an affinity to Kazak rugs, structurally, they are undisputed Karabagh. The thick yarn used by weavers in these two areas creates a superficial similarity to the weave patterns of the two types. The Caucasian rugs of this area have one of the few distinctive Caucasian weaves, consisting of two weft threads after every two rows of knots. The Kazaks, on the other hand, all appear to have an irregular number of wefts, from two to four, after every row of knots. 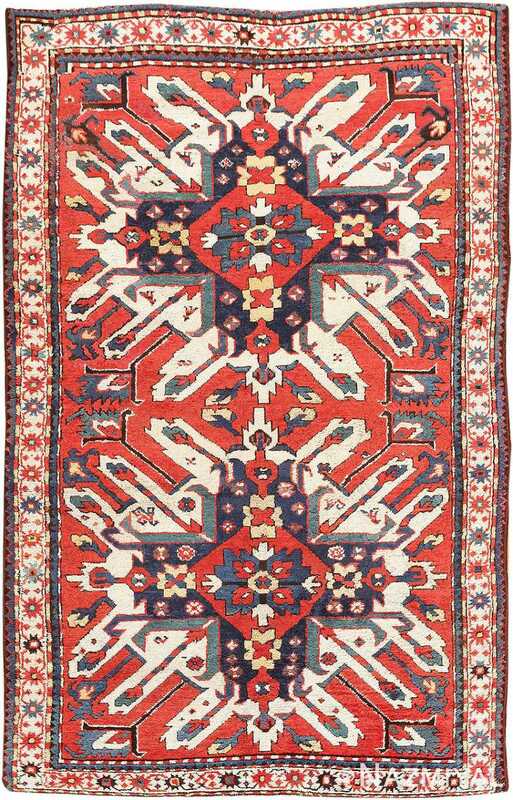 Chelaberd rugs were made in the southeast Caucasus, bordering northern Persia. The Caucasus mountain range stretches from the Caspian Sea to the Black Sea in the area of modern-day Azerbaijan and southern Russia, and it is in the villages of these mountains that some of the most highly collectible rugs originated. The most collectible rugs and carpets from this area are those woven between 1800 and 1900. The late nineteenth century is the last hurrah for village and tribal nomadic rugs. By the early twentieth century, they no longer used natural dyes, and the designs and weaving were much less appealing. Chelaberd rugs were predominantly made in traditional sizes such as 4’ x 6’ and 5’ x 7’…runners of this size were seldom woven in this tribal village. As a result, Chelaberd runners are very desirable and highly sought out by collectors. The best nineteenth-century Caucasian rugs exhibit the inventiveness of the cottage-industry weavers who created stylized versions of traditional design elements and used local materials to their best advantage. During this time, the use of natural dyes was still a practiced art, resulting in vivid colors. Design motifs such as sunburst medallions, dragons, and temple arches appear in many of the best village rugs. The origin of the name “Eagle Kazak” has several explanations. The medallion design in the center of the carpet is referred to as an Eagle design. There is some resemblance between these medallions and the Russian double-headed eagle. The other (less accepted) theory comes from the definition of Chelaberd itself. Some claim that Chelaberd means Eagle in the local dialect, a blend of Armenian, Russian and Arabic. 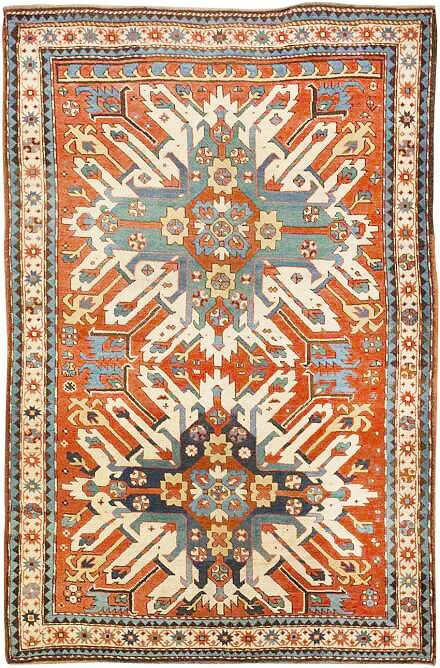 The Eagle Kazak Style is one of the most enduringly popular antique rug styles, prized for their cultural authenticity and vibrant colors.